Andrew Garfield once again confirms he'd like to see his Amazing Spider-Man show up in the Avengers universe. It's well-known that Sony and Marvel were * this * close to a deal that would have slipped an Easter egg in the form of The Amazing Spider-Man's Oscorp Tower into the New York City skyline of The Avengers. As it turned out, Marvel's SFX team were already nearly done with their film by the time this happened, and the subtle crossover never materialized. Well, at least the stars and director of The Amazing Spider-Man 2 wish that wasn't the case. In an interview posted today on Yahoo! 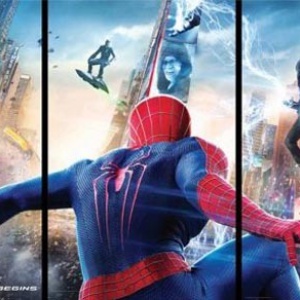 Movies UK, stars Andrew Garfield, Emma Stone and Jamie Foxx, and director Marc Webb, were asked if they'd like to see a crossover, and the consensus was a very diplomatic yes. "I think everyone would love to see that," Garfield said. "The thing is that I would love that, the fans would love that. Obviously, big business and lawyers and rights issues are an obstacle. In my naivete I'm all 'let's put all that aside and just do it!'." Obviously, this is just a puff-piece interview and the responses therein should not be taken in any way to indicate that this is a real possibility. But, it's worth noting that this isn't the first time Garfield has mentioned wanting to insert himself into the MCU. At Comic Con 2013, during the Amazing Spider-Man panel, when asked by a fan what element from the Spider-Man comics he'd most like to do in the films, he said, unambiguously, "I'd like to be an Avenger." I'm actually a fan of Andrew Garfield's take on Peter Parker and Spider-Man, so I'll admit I'd really like to see him in an epic snark duel with the RDJ version of Tony Stark. However, given how uneven and plodding The Amazing Spider-Man was, I can't say I'm particularly upset about a lack of ties to the MCU. I'd rather see if Marvel could work actual magic with the wall crawler on its own terms, especially considering how they managed to take one of the Marvel Universe's silliest characters - Loki - and turn him into one of the greatest screen villains of all time. Sony, meanwhile, can't figure out how to celebrate the weirdness of the Spidey-corner of the Marvel universe and take it seriously at the same time, so the result is stuff like the hilariously awful Green Goblin unveiled a few weeks back. Fortunately, we'll be spared seeing Captain America square off against the power-armor version of Jean-Ralphio Saperstein (h/t), as there is no way Sony will relinquish creative control over Spider-Man to fit him into the MCU. Hell, the reason the Amazing Spider-Man franchise even exists is that Sony wants to keep the rights to Spider-Man and his related characters from ever reverting back to Disney. Besides, that weird, almost-was crossover sounds kind of cool, in the same way seeing ETs as members of the Galactic Senate sounded cool right up until we actually saw The Phantom Menace. So maybe we dodged a bullet. Unless The Amazing Spider-Man 2 ends up being awesome, in which case cue tears from me. Source: Yahoo! Movies UK, via Comic Book Movie.